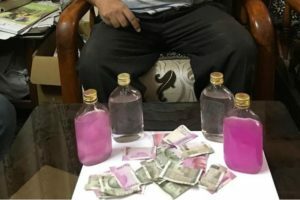 Police Report: A law officer in Telangana was caught taking a bribe, the officer also tried to flush the money in the toilet as an attempt to wipe out the evidence. On Monday, officers from the ACB (Anti-Corruption Bureau) arrested Shakeel Ansari an Assistant Public Prosecutor after he was caught taking a bribe. Shakeel Ansari works at the JCFM Court in Shadnagar. The police said that Shakeel asked Prabhakar Reddy to pay Rs. 8,000 for removing the name of his mother from a case. Prabhakar Reddy filed a complaint at the Anti-Corruption Bureau, who set up a trap for Shakeel which led to his arrest. Shakeel Ansari was collecting the bribe money from Prabhakar Reddy when the Anti-Corruption Bureau arrived and arrested him. Shakeel also ripped the money and flushed the tore ones in the toilet. But officials from the ACB recovered the money.